We love the New Year! It comes right after we’ve made a concentrated effort to bring joy to others and show compassion to those less fortunate. The extra time off from work and school also gives us the mental break to be introspective and think about our future. What do we like about ourselves and our situation? What are we willing to do to improve ourselves and our situations? On the heels of a holiday centred on celebrating and reinforcing connections with others, we may be thinking… how can I connect and help more people, more regularly or more meaningfully? Our take on New Year’s Resolutions is that these avowals fall under two broad categories: self-improvement or making the world a better place. Self-improvement can include eating better, exercising, getting more sleep, dropping bad habits (i.e. smoking, overspending, overdrinking, excessive screen time, procrastinating), learning something new, applying yourself more to your career or education, etc. Making the world a better place can include spending more meaningful time with friends and loved ones, or being more involved with the family, workplace, or community. Some may see the former category as being selfish – that it’s not right to focus so much on yourself. We beg to differ. When you take good care of yourself, that responsibility doesn’t fall onto other people’s shoulders. If you have poor health and access more medical care, we all pay for this. If you don’t take care of yourself financially and end up on welfare, we all pay the price. If you’re always cranky and miserable, we all suffer. The critics and cynics that “pooh-pooh” the idea of New Year’s Resolutions are those who have no desire to put forth the effort to change themselves or else they take satisfaction in the downfall of others. Most of the time, they have an underlying fear of falling short of their own deepest desires and so think it’s safer to not try it the first place. To divert attention from their own shortcoming, they mock those who do undertake the dreaming, planning, and hard work. We say, take full advantage of your heightened sense of hope and purpose, but recognize that meaningful goals are rarely achieved overnight, or without difficulty. It’s okay to pace yourself and start on a couple changes first and save others until the first ones become automatic and don’t require as much effort to continue. It’s okay to mess up, especially in the beginning. The key is to not give up entirely. It’s alright to ask for help, too. Interacting with supportive people can make the load lighter, guide you to make your journey easier, and give you encouragement when you need it most. Guess what? Taking care of (as opposed to indulging) yourself is a meaningful use of your time and energy. When you’re in a better state of mind, better physical state, better financial state, and make better use of your time and energy, you are more capable of improving the situations of people nearby and afar. The more you have, the more you can give before feeling drained. Chiropractic care is an excellent way to help you reach your goals of self-improvement. Pain, discomfort, and even mild nerve irritations can interfere with many plans for changing your life situation. They can take the fun out of exercise and make it feel like a chore or punishment. They can interfere with your sleep and make you a grumpy, negative, and irritable person. They can create a mental fog and affect your ability to think rationally, concentrate, or problem-solve. They can even affect your digestion and make you more prone to food sensitivities and prevent full absorption of the essential nutrients. Nerve irritations, discomfort, and pain make it difficult to stay positive, and persevere when times get tough. New Year’s Resolutions are tough because you’re challenging yourself to move out of your current comfort zone to a new sense and state of self. It can be scary, especially when it seems like new problems arise. They’re not always new. As we challenge ourselves, we can become aware of old issues that lay dormant. If you have a misaligned knee or weak hip, you may not notice it if you’re not putting much weight on it. Heading to the gym and using your body more… this is when you find your weaknesses. Chiropractic care can help you move through the difficult times by helping your body be in proper alignment so it can do what’s necessary. This includes shedding what doesn’t belong to you (inflammation, toxins, scar tissue, used neurotransmitters, mental static) and facilitating optimal brain and body functioning (through reducing nerve interference and biomechanical imbalances). Wouldn’t you like to think clearer, feel more at ease, and more energetic, make better decisions, digest your foods easier, be happier, perform better in school, sports and career, and feel more connected to the people you love, and the greater world? Chiropractic, like other good habits, are not a one-and-done. To get best results with the gym, the more you exercise, the fitter you become. When you want to make big changes, it can take extra effort at the beginning. When you reach your desired goal, it doesn’t take as much effort to keep the ball rolling. It’s a great idea to get periodic assessments of how you’re doing… to celebrate improvements or to find out how you may have lapsed if you’ve been complacent or faced extra challenges. Perhaps you’ve never done an assessment in the first place and are curious about your current state. We want to help you in your endeavours to improve yourself or make a difference in our world. To this end we are giving everyone an opportunity to get a full assessment in our office (up to $325 value) at no charge with a 15 lb food donation. For your convenience if you’d rather donate cash instead, we ask for $75 and we’ll go buy the food for you. If you’re an existing patient, we’ll give you an opportunity to get a free adjustment with a 5 lb donation (or $25) or a progress examination and adjustment with a 10 lb donation (or $50). Our VIP Wellness patients can choose a progress examination or bonus adjustment with their 5 lb (or $25) donation. This is a great way to get back in the chiropractic groove or to get started in the first place, so please share this special with everyone you know. Our greatest pleasure is seeing the impact one person can make by taking care of their own health and changing the lives of others by referring them to our office. We know and very much appreciate the generosity of our patient community. 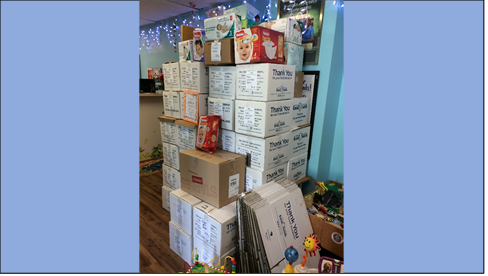 Last year we collected enough for us to send 2585 lbs of food for the Greater Vancouver Food Bank Society. This year, we hope to top 3000 lbs!!! A special shout-out to those who make donations without any expectations of something in return, and those for whom the giving involves a sacrifice. We thank you in advance for being a bright lightbulb and helping us make this a better place for us all.